PRAYING TO THE SAINTS began with the practice of praying for them. Any Christian who died was remembered in prayer, and services took place on the third, seventh, ninth, thirtieth, and fortieth day after death. For martyrs, annual remembrances of their death were celebrated and called “birthdays,” the day the person was born into heavenly life with Christ. Soon churches drew up lists of martyrs, believing that prayer for martyrs was of “great benefit to those for whom it is offered” (Cyril of Jerusalem). Origen said praying for the dead attested to the living unity of Christians in heaven and on earth—the communion of saints. Gradually, the church believed that martyrs, having made the ultimate sacrifice, already lived fully in God’s presence. They didn’t need the church’s prayers as much as the church needed theirs: “Only God can pardon, though we see that the merits of the martyrs have great weight before his tribunal” (Cyprian of Carthage). Despite fears of idolatry, the practice of praying to saints was affirmed by later church leaders such as Augustine and Aquinas. 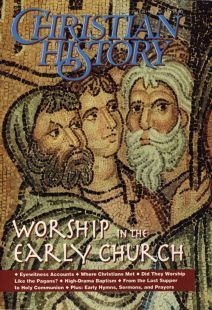 In third-century Rome, baptism was high drama. Excerpts from an ancient Christian sermon.